The 3rd brand new page is here, so I'm well on the way to completing my 1979-82 adaptation. I wouldn't call it finished but I simply don't have the spare time to perfect it. 30 minutes here at night - 15 minutes there in the mornings before work. I can always return to these when time allows and make the even better. A lesson to the young, free and single: whatever it is you want to do - do it now! While you have the time and energy. 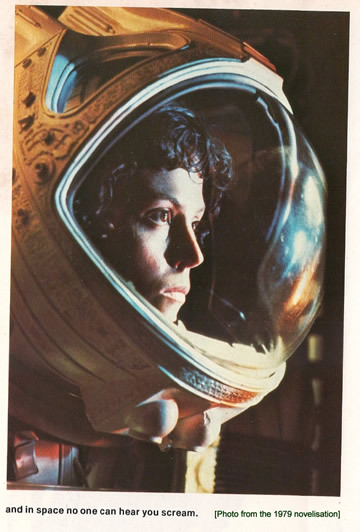 Ripley's a hell of a woman - just like Dr. Shaw in PROMETHEUS. Continuing along the lines of the novelisation, just as I did when I was a child, Ripley calls the alien back to her in order to save the cat (what?!?!) and then - most impressively - kicks open the door and charges, lance in hands, into the terrifying creature. Taking a deep breath, she slowly unlatched the door, then kicked it open. The alien turned to face the locker, caught the steel shaft through its mid-section. Ripley had run with all her weight behind it, and it penetrated deeply. The Alien grabbed at the shaft as yellow liquid began to spill outward, hissing violently where it contacted the metal. She doesn't seem too worried about pints of acid eating through the hull but I suppose there aren't many alternatives. Besides, perhaps her plan involves rapidly evacuating the acid out into space..? Incidentally, if you are ever in Venice, skip the overpriced Gondola ride (you can take a cheap trip on the Tragetto instead!) and head for the Scuola Dalmata di San Giorgio degli Schiavoni. It's quite a mouthful, and be prepared to find it shut the first time you get to it, but it's worth the effort. A tiny guildhall if you like or Scuola as they were called. It's inexpensive but an enchanting space. You can see Carpaccio's painting, one part of a whole painted cycle about the Saint, lit by candlelight, exhibited (almost) in the place where it was meant to be seen. I believe it was originally upstairs. It produces an almost Mark Rothko effect on the eyes in the dim light. And when you leave the Scuola expecting to find a shop that sells a poster reproduction, all I can say is 'good luck'! That weird picture of her with no body again! You might reckon that Ripley's white spacesuit and helmet in the film was just a spare one that the art department hadn't painted up - but then again, with director Ridley Scott you can never be too sure. The symbolism of the good, in white and the bad, in pure black is compelling indeed. And its not just the symbolism either, Ripley is even more vulnerable adorned in bright white. How could it miss her?